I will start this review with what the side of the bottle says: "If you don't like hops, don't buy this beer. The intense bitterness and pungent, fruity hoppiness may confuse your tastebuds to an extent where there would not be enough voltage left in the world to electroshock them back into coherence." It sounds exactly like what I'm looking for tonight, a massive hop bomb! 8 Wired is a brewery I'm quite familiar with, however I haven't had this particular one before. Their beers are brewed out of the Renaissance brewery in Blenheim, New Zealand in a contract brewing arrangement. I can't think of a bad 8 Wired beer (or Renaissance beer for that matter...) that I've had, I can't wait to try this. On the nose there is plenty of tropical fruits ranging from the normal passionfruit and mango right through to the strange lychee (I'm pretty sure it's lychee). There is heaps and heaps of hop bitterness on the nose, as promised in the blurb. As the Super Conductor warms up more piney notes come through, this smells exactly like what I was hoping it would. The electric blue colour of the label doesn't do this beer justice, it's even more in your face if that's possible! There is this tiny little malt base at the start of this beer before it is swamped by hoppy bitterness. I can taste so much fruit in the hops, there is plenty of passionfruit, mango, grapefruit, lychee (I was right!) the list goes on. There's also lots of pine, which I love. This all combines to be one of the driest IPA's I've ever had! 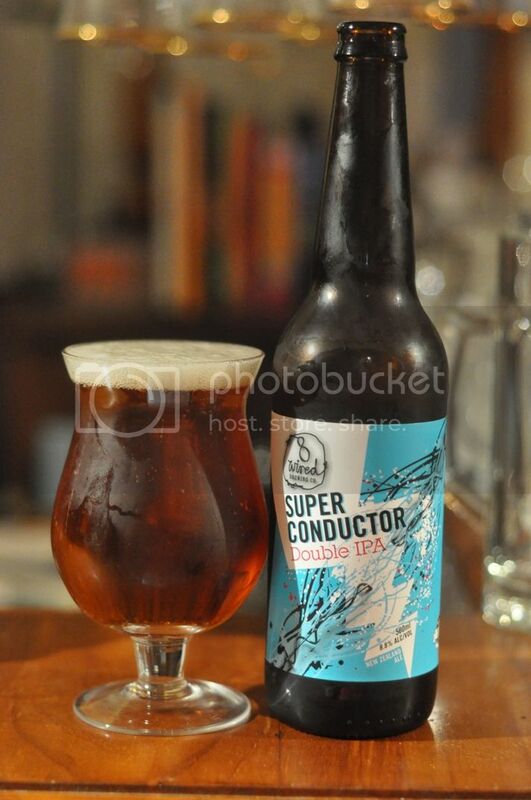 8 Wired's Super Conductor is a huge Imperial IPA full of the characteristic hop bitterness that one would expect from the style. Apparently it's 90 IBU but if they'd claimed 100-110 I wouldn't have argued, it's incredibly bitter but still brilliantly balanced. Quite seriously this could quite easily become a fridge regular at my house! Brilliant! If you love IPA's buy this one, you won't be disappointed!